Breakfast was great. Really well done cooked. We had an executive room. Bed very comfortable. Great stsy. Our first in a Holiday Inn but we were favourably impressed. Will choose Holiday Inn again in future andy husband thought they were better than a Hulton! Staff were very helpful and friendly. Breakfast was excellent. Breakfast was lovely and the staff were very helpful! The room was clean. The staff was really welcoming and friendly, even giving us recommendations for places to eat, around town. The bed was comfortable and the room was clean. It was also spacious. The staff were also friendly and attentive. Holiday Inn Stevenage This rating is a reflection of how the property compares to the industry standard when it comes to price, facilities and services available. It's based on a self-evaluation by the property. Use this rating to help choose your stay! Close to the city center and only a 10-minute walk from the railway station, Holiday Inn Stevenage has a mini-gym and features a modern and stylish Destinations Bar and Restaurant. The hotel is easily accessible from junction 7 of the A1 (M). Holiday Inn Stevenage has air-conditioned rooms with flat-screen TVs and black-out curtains. Tea/coffee making facilities, desk and private bathrooms are also featured. Free WiFi is available through the hotel. The hotel offers conference facilities for up to 400 guests and guests can start the day off with a a buffet breakfast including a selection of continental and cooked items. Luton Airport is 30 minutes' drive away. Central London can be reached in a 40 minutes' train journey, with direct trains to King Cross Station. When would you like to stay at Holiday Inn Stevenage? 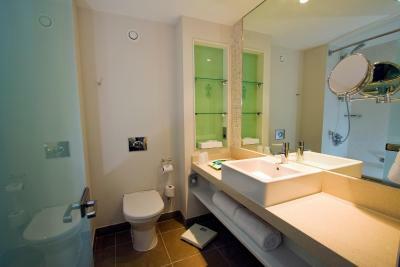 This room complete with a shower, also has Wi-Fi, a flat screen TV, air conditioning and tea and coffee making facilities. This spacious room complete with a shower and bathrobe, also has Wi-Fi, a flat screen TV, air conditioning and tea and coffee making facilities. This accessible room complete with a shower, also has Wi-Fi, a flat screen TV, air conditioning and tea and coffee making facilities. 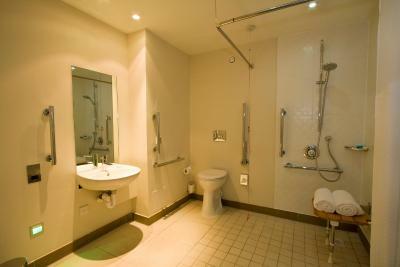 This room is complete with a shower has Wi-Fi, a flat screen TV, air conditioning and tea and coffee making facilities. This room is complete with a mini bar also has a shower, a work desk, free Wi-Fi, a flat-screen TV, air conditioning and tea and coffee making facilities. This room complete with a mini bar, also has a shower, a work desk, free Wi-Fi, a flat-screen TV, air conditioning and tea and coffee making facilities. This spacious room is complete with a shower and has a work desk, Wi-Fi, a flat-screen TV, air conditioning and tea and coffee making facilities. This room complete with a shower, also has a work desk, Wi-Fi access, a flat-screen TV, air conditioning and tea and coffee making facilities. This room complete with a roll in shower, also has Wi-Fi, a flat screen TV, air conditioning and tea and coffee making facilities. Comment from Gerard Ryan General Manager of the Holiday Inn Stevenage Hotel since opening in December 2008 and who carries a wealth of knowledge in the Hotel industry. 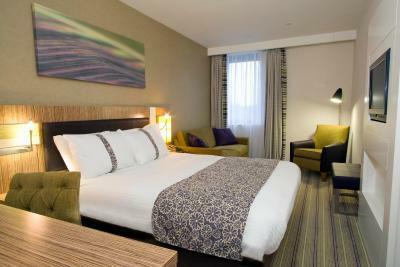 Holiday Inn Stevenage provides a 4 star offering in the heart of the town. The Hotel is now an established venue for regular guests and conference delegates to enjoy their experience in a relaxed, friendly and contemporary environment where Stay Real is at the heart of what we do. 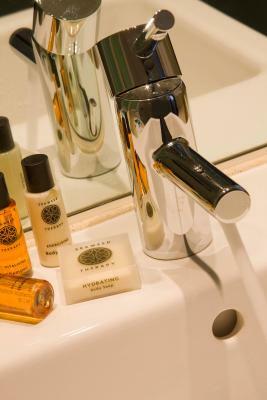 House Rules Holiday Inn Stevenage takes special requests – add in the next step! Holiday Inn Stevenage accepts these cards and reserves the right to temporarily hold an amount prior to arrival. Please note that public parking is off site and it costs GBP 3.70 per exit. Liked everything. Got parking on site, but I took a taxi to venue because I did not want to lose space. Happy to spend £10 to park overnight. Could not get wi fi not sure why an my only concern was i requested a shower which was there but in a bath that i cannot put my leg over into so no shower. So sad . It took over 25 minutes to checkin......still made me pay full price for parking, and did'nt over to upgrade or reduce the rate. PS. At checkin I was the only person checking in. I was very surprised to have pay separately for car-parking - IN THEIR OWN CAR-PARK! Food selection in restaurant mediocre eat elsewhere. Clean, comfortable, good value for money. One light bulb was not working.